The state of Oregon currently incarcerates just over 15,362 sentenced inmates in 14 prisons, 1 federal penitentiary, and an extensive county jail system. All facilities have a need for professional and assertive staff to fulfill a variety of front line correctional roles within each facility and all are maintained and funded through Oregon's State Department of Corrections. Some, like Oregon State Penitentiary are maximum security facilities, while most are medium to minimum containment. Though incarceration rates are slowly levelling off, a new approach to avoiding re-offense means that there will still be steady growth in correctional officer roles over the next ten years throughout the state and nationally; over this time period, the Oregon will be looking to hire an additional 262 personnel to their existing workforce as well as replacing employees who have retired, advanced, or left the field. Interested so far? Read further on our page for more information regarding employment opportunities for correctional officers in Oregon or apply through the Department of Corrections portal. Tillamook Bay Community College ranks first in our latest rankings with five students graduating from programs in criminal justice out of a total 124 students.
" 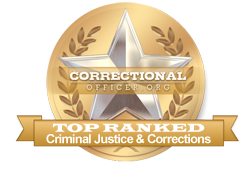 In addition to being top ranked for many years in Criminal Justice in general, we are glad to be ranked highly by the subfield of Corrections in Oregon through this current ranking, and accept it as one of the numerous accolades we have received from many agencies locally, regionally and nationally regarding the high quality of our graduates. Our program is designed to the highest standards of the American Criminal Justice Sciences, and being the oldest of the 4 -year degree granting State universities in the State, with a Graduate Studies Program, our program prides itself in its superiority through a focus on quality, access, and flexibility. We have awarded the highest number of degrees in the State and offer a wide variety of specialties within Criminal Justice. We focus on producing the highest quality graduates prepared to occupy the highest ranks within the Criminal Justice System, and have graduates in the top ranks of local, regional, and national agencies. Take a look at our website www.wou.edu/criminal-justice for details of what we offer you." Southern Oregon University ranks 3rd in our latest rankings with 67 students completing programs in criminal justice out of a total two thousand students. Chemeketa Community College ranks 4th in our latest rankings with eighty students completing programs in criminal justice and security and loss prevention services out of a total three thousand graduates. Klamath Community College ranks 5th in our latest rankings with nine students completing programs in criminal justice and corrections out of a total 470 students from the 2012-2013 school year. Candidates who meet the department's requirements and screenings up to this point will be scheduled for an in-person interview. After that, selected candidates will be offered an placed in a hiring pool and enrolled in new hire training. Training at this stage focuses on practical tactics for the job, as well as policies and procedures that are applicable to the role. Personnel that have completed this last phase of the hiring process will be posted to job vacancies as the need arises. One of the ways that the state of Oregon serves and supports correctional officers is through strong growth and competitive salaries throughout the state. As such, the median income for front-line correctional officers throughout the state is currently higher at $53,800 than the national median income at $39,800. According to the occupational profile for the state of Oregon found at http://www.careerinfonet.org/occ_rep.asp?next=occ_rep&Level=&optstatus=011000000&jobfam=33&id=1&nodeid=2&soccode=333012&menuMode=&stfips=41&x=37&y=7 and published by CareerInfoNet.org, state and national trends predict a 6% and 5% increase in correctional officer jobs by 2022 respectively, indicating that state growth is strong. For residents of Oregon this rate translates into 140 job openings per year. The table below lists career information organized by the BLS for correctional officers in Oregon. The table is sorted by total employment, with the largest metropolitan areas listed first.